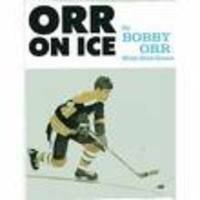 The image reads Orr on ice, but Ice on Orr may have been more appropriate. 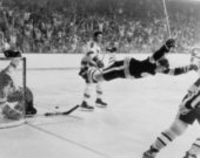 Bobby Orr was in my opinion the greatest hockey player ever, and that says a lot, coming from a Habs fan. Sadly his amazing career came to an early end because of bad knees. I'm not sure if ligament injury was more common then, but surgical repair was surely much less sophisticated. Many of the players of the day have developed severe OA of the knees. 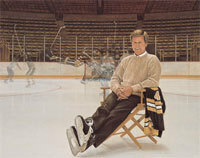 Bobby Orr was one of the most famous. Some days he would do anything to reduce weight bearing, here cleverly disguising this tactic by scoring important goals. Other attempts were less successful and somewhat more transparent.